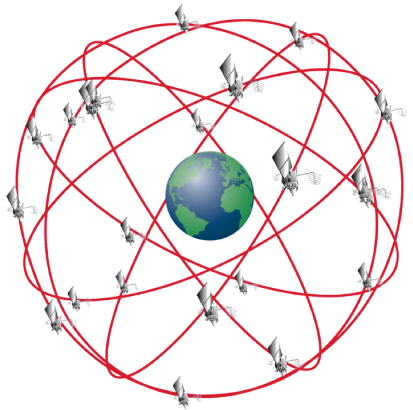 The Global Positioning System (GPS) is a United States maintained constellation of satellites that provide access to a space-based navigation system. It gives location information if there is an unobstructed view from four or more GPS satellites. This information is freely accessible to anyone with a GPS receiver anywhere on or near the earth surface with an accuracy of 3 m.
GPS constellation. The red circles represent orbits and also the satellites are depicted traveling along each circle. The Russian equivalent is called GLONASS (Global Navigation Satellite System) and is operated by the Russian Aerospace Defense Forces. As the GPS constellation of satellites, this constellation covers the entire globe that is why we also refer to this as the only two Global Navigation Satellite Systems (GNSS) available. At this time, the European Union (EU) and the European Space Agency (ESA) are developing Galileo which will be an alternative high-precision positioning system and is meant to work independently from the Russian GLONASS and US GPS system. Galileo low-precision services will be open to everyone. There is another global navigation system under construction that is called COMPASS. China decided to build an independent satellite navigation system back in the 1980’s as a national strategy. Other local and regional satellite navigation systems exist covering specific areas along the world such the Indian Regional Navigation Satellite System (IRNSS) in India or the Quasi-Zenith Satellite System (QZSS) in Japan. For tracking a balloon in a real flight we are going to be using different types of communication methods that we will introduce to you in future posts. These communication methods will be mainly based on the usage of the GPS network.